The Executive Council of the Lagos State chapter of the Peoples Democratic Party (PDP), has removed the party’s chairman, Mr Tunji Shelle. Shelle was subsequently replaced by Alhaji Owolabi Kamal Olorunoje, the party’s vice chairman, Lagos Central. It was gathered that the EXCO reached its decision after a disciplinary committee was set up to investigate some allegations levelled against Shelle. The outcome of the committee’s report was not made available to the press as at the time of filing this report. Olorunoje, who has been an active player in the revival of PDP in the state, will hold the office in acting capacity. 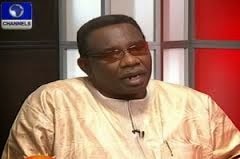 Olorunoje, a foundation member of the Lagos PDP, was a member of the Lagos State House of Assembly under the NRC in 1991. He equally contested for the same position under the PDP in 1999 and lost. “We know we have to work hard to achieve our desire to take over the governance of Lagos State and that is why everyone of us has braced up to the task ahead, and what we are doing specifically is to convince the people that a Peoples Democratic Party government will give Lagosians better governance – a government with human face and which will bring about socio-economic development like they have never seen before,” Olorunoje said during an interview recently.